The nation is set to observe the 47th Victory Day of the country. Bangladesh achieved independence on the 16th December in 1971 after a bloody war. The day is celebrated amid great festivity annually. As part of the celebration, the capital gets a fresh look. Marking the day, the capital city has started changing her look. Almost all the major city streets are illuminated with lights. The national flag is also visible in some points of the city. And all the lighting has cast a positive impact on the city dwellers. 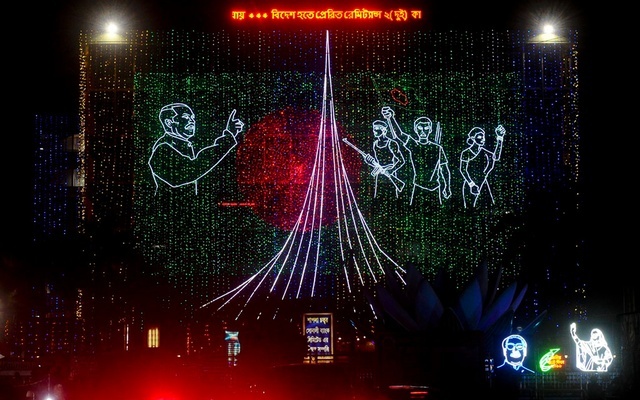 Focusing on the development activities, banners and festoons have been used in important intersection while the banners also contain the Victory Day greetings. The preparation to illuminate the entire city is still underway. Some of the most important places are yet to be decorated with lights. The entire city will be enlightened and thus the staffs engaged into the activity. A large number of ordinary people are charmed with the nice decoration and they expressed their joys too to this reporter.